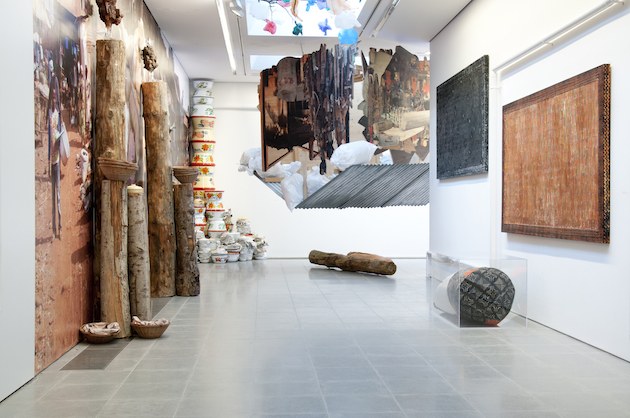 As you enter the Serpentine Sackler Gallery, you are taken over by an accumulation of objects, assembled from a diversity of materials, found elements and visual icons. This aesthetic of abundance and aggregation is characteristic of Pascale Marthine Tayou’s work, through which he questions power, status and inequality in today’s world. Born in Cameroon in 1966, currently living and working between Ghent in Belgium and Yaoundé in Cameroon, Pascal Marthine Tayou is a self-taught artists, who approached the art world after studying law. 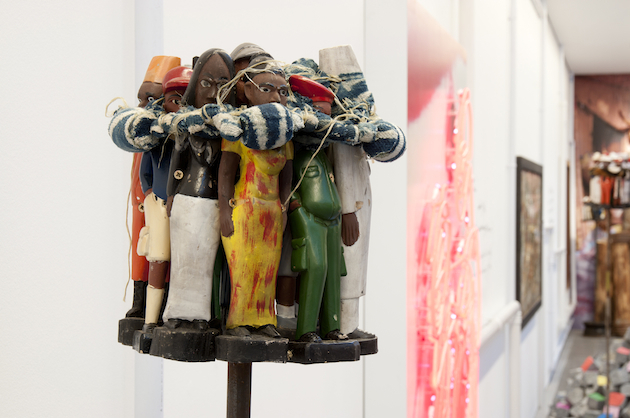 Tayou began exhibiting in the early 1990s – a time of political and social upheaval across West Africa, with works often produced in situ, renowned for combining found and discarded objects and materials – often sourced locally – with a skilled and playful sense of craftsmanship. 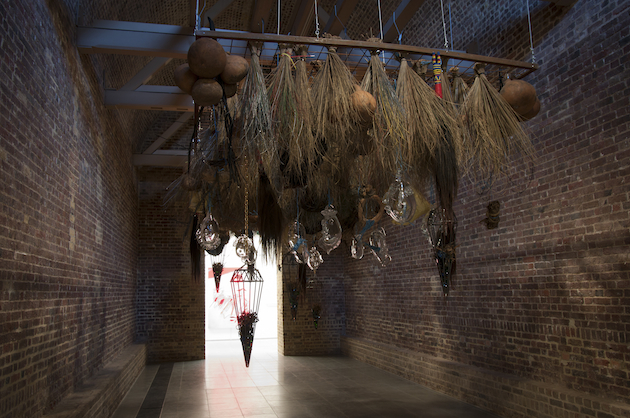 The show at Serpentine Galleries, titled “Boomerang” is Tayou’s first solo show in London. The exhibition includes new work made specifically for the Serpentine and introduces audiences to a range of works that demonstrate the artist’s unique ability to combine issues of individual and national identity and global consumption. 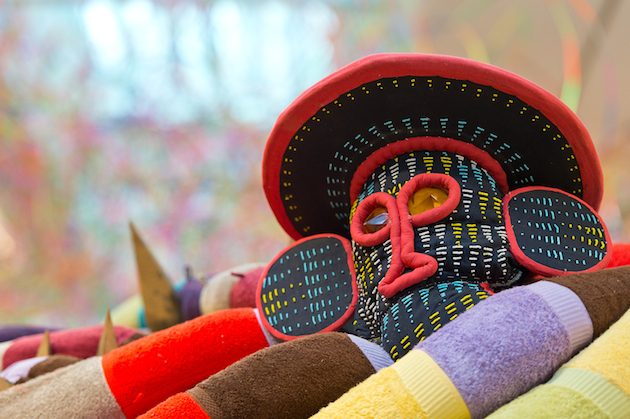 The gallery is populated by a diverse mix of sculptural forms that demonstrate Tayou’s unique visual language based on archetypes, made and found objects and traditional craft. Mysterious human forms and fantastical beasts – such as the 100 metre snake of Africonda – incorporate materials such as cloth, wood, plastic, glass, organic matter and consumer waste combined with an artisanal skill. 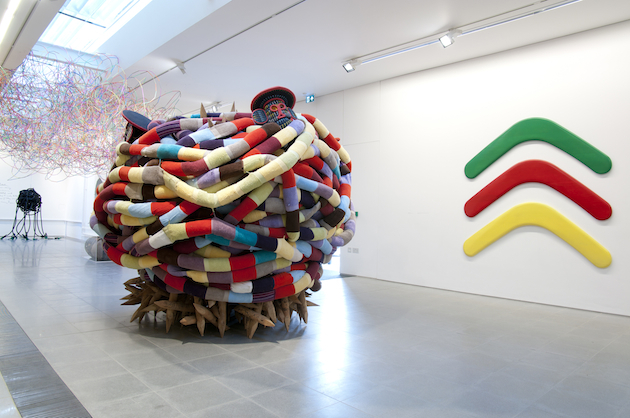 The exhibition runs until the 17th of May 2015 at Serpentine Sackler Gallery in London.